Kids love miniatures, so why not make some Mini Bunnies! This is a great rabbit craft and a fun Easter Bunny Craft for Easter! A preschooler can do this craft, but keep in mind that the little parts may be hard for some to handle well! Make a few of these and put them on a paper plate covered with green Easter grass and some Jelly Beans and you've got one cute Easter Decoration! 1. First prepare your bunny's ears and feet. Cut 2 Q tips a little bit longer than the swab part, these will be the bunny ears. Cut the other Q Tip to make 4 feet, cut them right where the swab part starts. 2. Put glue on the ends of the long Q Tips and glue them in place on your cotton ball to make the bunny ears. 3. 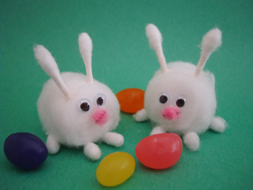 Glue your last 4 Q Tip swabs onto the bottom of the cotton ball to make the bunny's feet. 4. Glue on your eyes and a pink nose and you're done!